More Americans believe Republicans in Congress, rather than the Obama administration, would be mainly responsible if the two sides cannot agree on a plan to increase the federal debt limit. About four-in-ten (42%) say Republicans would bear the most responsibility if the debt limit is not raised and the government is unable to borrow more money to fund its operations. A third (33%) say the Obama administration would be mainly responsible, according to the latest survey by the Pew Research Center for the People & the Press and The Washington Post conducted June 16-19 among 1,003 adults. As Vice President Biden holds budget and debt-reduction talks with lawmakers, partisans express strong opinions about which side would be most responsible if no agreement is reached before the limit is hit as soon as early August. About seven-in-ten Democrats (72%) say Republicans would be mainly responsible. 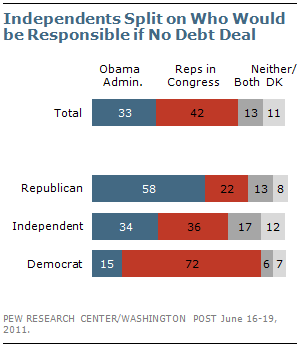 Nearly six-in-ten Republicans (58%) say the Obama administration would be mainly responsible.